All of the great religious and ethical codes in the history of civilization have had one common denominator: Love one another. This dictum of caring for others has been explained in extensive writings in the fields of theology, philosophy, and literature that cite the resultant benefits to the recipients, the sense of altruism in those who share, and the cohesive benefits that accrue to society from these interchanges. Less well-known are the findings on these caring attachments and interchanges in medicine and the behavioral sciences. These latter studies support the general dictum noted above, and demonstrate that these caring attachments and interchanges that occur in helping others may result in good physical and mental health, a sense of well-being, and an extended life span for both the provider and recipient (1,2). The purpose of this essay is to review the latest medical and behavioral science findings about the nature and benefits of caring attachments in our concern for others. Humans are social creatures and it is not surprising that individuals seek to link up with other humans in healthy and socially acceptable ways. Caring attachments or social supports are the names given to these interchanges. These attachments are the foundation for loving others, which is defined here as helping another person grow to his or her potential without expecting anything in return and as long as neither party is being physically or psychologically harmed. The roots of the current scientific findings or attachments are found in the work of two physicians following World War II (2). René Spitz, MD, was one of the first to call attention to the importance of caring attachments and how their absence could be lethal. In 1945-46, he studied ninety-one infants in orphanages in North America. All were well-cared for by non-related staff, yet thirty-four of them died during the last three months of their first year of life. They died in spite of good care and from no obvious medical disease. Spitz wondered if the absence of biological parent(s) somehow contributed to this outcome. Part of the answer to this question came from the work of John Bowlby, MD (2). Bowlby believed that infants were born to interact socially as a way of ensuring survival. He observed that if a contented child were left by his or her mother, the child cried out in protest, and that, if the mother did not return, the child became depressed and detached. This disruption interrupted normal growth and a variety of problems emerged over time. Bowlby called this bond an attachment. Subsequent research enhanced our understanding of the nature of this bond and some of the ways normal attachment may be disrupted in the early parenting process with consequences that may last a lifetime. Attachments are biologically based bonds initially for the young for protection, survival, and the teaching of skills to cope successfully with life events. In healthy normal parenting, the parents provide emotional support, set clear limits consistently, and reward successful task completion. Over time the child develops a healthy sense of self and coping skills to solve problems adaptively, and to self-regulate distress when that occurs. There are three types of attachments wherein this normal process may be disrupted: avoidant, ambivalent, and disorganized. In an avoidant attachment, the parents are emotionally unavailable or rejecting and the normal process of early childhood growth does not occur. Children adapt in these situations by avoiding closeness and emotional connection in all subsequent attachments. In the ambivalent attachment process, the parents’ communications are inconsistent and at times intrusive. Children reared in these types of situations learn not to rely on others and may become anxious and ambivalent in their interactions with others. The third disrupted attachment is the disorganized attachment. Here the child’s need for closeness remains unseen or ignored and the parents’ behavior becomes a source of disorientation or even terror rather than providing clear limits. In this third attachment, the child’s experience with his or her parents overwhelms the child and its subsequent attachments to others become disorganized and/or chaotic. Subsequent worldwide research by Lynch (2,3), has built on these early findings and clearly documents that caring attachments do in fact result in good physical and mental health, a sense of well-being, an extended longevity in both children and adults. These findings are presented here succinctly. (See [1,2,3] for more detailed review). There are several psychological benefits arising from caring attachments. The most common ones are: companionship, emotional support in good times and bad, information from others about solving life’s stressful problems, and instrumental favors in the forms of money or political influence on one’s behalf (1). These caring interchanges are encountered in two basic formats. The first are networks, which refer to groups of persons that we find ourselves embedded in by life’s circumstances, such as family, work, school, or community clusters. The second are attachments known as buffers. In these cases individuals encounter people who are not routinely in their networks but are brought in to buffer or assist with specific life events. Common examples might include the accountant at tax time, the minister at a wedding, or the car mechanic for needed repairs. Other types of attachments, however, may actually prove to be harmful. Included here would be physical and/or sexual abuse, emotional over-involvement in the lives of others, emotional demandingness by one party, interpersonal-skill deficiencies in forming and sustaining helpful attachments, and clashes in fundamental values in the parties involved. In studying helpful, supportive caring attachments, Lynch found that a person’s cardiovascular system (blood pressure and pulse), the person’s immune system to fight upper-respiratory infections, and the person’s endorphin endogenous opioid system (chemicals in the brain that make us feel good) were all strengthened in the presence of caring attachments and that these contributed to good physical and mental health as well as a sense of well-being. Unfortunately, the reverse was true for socially isolated people. For example, he found that divorced or single people had worse physical and mental health than happily married people; that school dropouts who lost their classmates by withdrawing died many years earlier than those who had completed school; and that single men at age fifty-five died ten years earlier than married men at age fifty-five. The absence of caring attachments contributed to premature death. These biological benefits are so powerful that the mere presence of other person in non-hostile encounters stimulates physical-health benefits. There are at least three important factors that may complicate the interactive nature of caring attachments. These include being in an anomic society, a person’s optimal level of stimulation, and one’s level of material expectation. Today, potential helpful attachments may be complicated by changes in society at large. We live in what is known as an anomic age (4). Sociologist Émile Durkheim noted that every society is composed of five basic institutions that govern how people are to behave with each other and rear their children. These institutions include families, schools, businesses, governments, and religious-faith traditions. When these five institutions are in agreement on basic socially acceptable values, the members of that society know how to behave and rear their children and a sense of community cohesion is present. However, when a society is impacted by a major cultural event, the five basic institutions do not have a common set of values and the sense of community cohesion for one another is lost. This lack of social cohesiveness is known as anomie. Societies marked by these major cultural shifts experience sharp increases in mental illness, suicide, substance abuse, and violence. Given the importance of caring attachments, an obvious question arises: How many friends should one have? Do more friends equal better health, well-being, and longevity? How does one’s level of optimal stimulation affect the caring attachment process? The human body takes in information through sight, hearing, taste, smell, and touch. A person’s nervous system is wired to take in this information, process it in the cortex, and then make an appropriate response to one’s immediate environment. Recent research has demonstrated that an individual’s nervous system for processing this information of inputs/outputs has an optimal point of functioning (5). If this optimal level of stimulation is exceeded, the individual will become overwhelmed, angry, and irritable. If the ideal level of stimulation is greatly reduced, the individual will become bored and also irritable. Thus, the goal is to maintain an optimal level of information: a balance of information input and output. Science has also found that individuals have one of two biologically determined set points for optimal levels of stimulation. Some people need little stimulation to reach an optimal level. These people are quiet, interested in nature, reflective, and have a few close friends. Others need a good deal of stimulation to reach their optimal level. Their lives are characterized by much activity, constant involvement, and many close friends. Thus, the number of caring attachments that one will have in life varies by one’s biological level of sensory stimulation. More friends are not necessarily better; it is the supportive nature of any caring attachment that matters most. Forcing the issue one way or the other will only result in physical and psychological distress. A third important factor to consider in fostering caring attachments is to consider one’s level of material expectation. An individual’s level of material expectation is the quantity of goods and services that one wishes to obtain from society with one’s take-home pay. As we have noted, we live in an age that values the acquisition of material goods. These goods are often quite expensive and are paid for out of one’s take-home pay. If one has a low level of material expectation, one will not spend all of one’s take-home pay on material goods and services and will end up with savings. If one’s level of material expectation is high, however, all of one’s salary will be spent and credit cards will be utilized to fund any remaining costs. Since money affects all of our relationships from paying for dates, paying child-rearing expenses, paying college tuitions, and the like, finances and credit-card debt become serious stressful issues in our culture. Credit-card debt is the current leading cause of divorce in our society. Better for wellbeing to have more reasonable levels of material expectation and the time and energy to develop and sustain health-engendering caring attachments. This short review has outlined the powerful psychological and biological benefits of caring attachments and caring for others as part of that process. This information will be to no avail if an individual has a high level of material expectation and unwaveringly seeks material goods. None of us has the energy, time, or money to do and possess everything that our culture has to offer. More importantly, such pursuits limit the time available to develop the caring attachments that bring health, happiness, and a long life. Everything in moderation leaves time for caring attachments to others. 1. Flannery, R.B., Jr. The Violent Person: Professional Risk Management Strategies for Safety and Care. New York: American Mental Health Foundation, 2009. 2. Lynch, J. The Broken Heart: The Medical Consequences of Loneliness. New York: Basic Books, 1977. 3. Lynch, J. A Cry Unheard: New Insights into the Medical Consequences of Loneliness. Baltimore: Brancroft, 2000. 4. Durkheim, É. Suicide: A Study in Sociology. Trans. Spaulding, J., and Simpson, G. New York: Free Press, 1997. 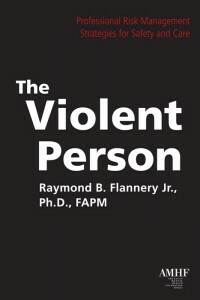 Raymond B. Flannery Jr., Ph.D., FAPM, is an internationally recognized scholar and lecturer on the topics of violence, victimization, and stress management. Dr. Flannery is available for lectures and workshops for all types of groups, and may be reached at the American Mental Health Foundation. Call 212-737-9027 or Email Evander.